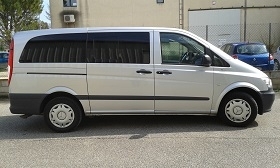 Provence Tours has its own fleet of recent Mercedes Vito minivans. In order to ensure the best comfort to the passengers, they are all air-conditioned and equipped with a sound-system. For more privacy, optimize visual comfort and limit any possible effects of glare, rear windows are tinted. We remain in line with the transportation legislation and are allowed to enter the Marseille seaport to we can meet the cruise passengers stopping over for the day, at the Cruise Terminal. For larger groups, we can also offer you transportation in 30 or 50-seater coaches upon request, don't hesitate to contact us for a personalized quote. Carefully selected for their deep knowledge about Provence and their wanting to share it, our drivers committed themselves to provide an excursion or a transfer in the best conditions. Most of them have lived in foreign countries, they can speak several languages and are accustomed to welcome travelers from all over the world. All our drivers have been holding their driving license for more than 3 years. They take an one-week internal training on the field and on transport safety to guarantee an unforgettable trip in Provence.